HomeNewsSamsung Galaxy Fold: A Smart Phone or A TV Remote? This week The South Korea electronics company has revealed Samsung Fold to media. Bloggers and YouTubers have got their hands on the device but it is not yet released for customers. The phone comes with novel technology, a foldable screen. Although it is a huge move to make smartphones smarter but customers feedback has yet to be seen. Prior to the release of the phone, it is hard to say whether Samsung Galaxy Fold is something that users wanted or something that users needed. MAYA (Most Advanced, Yet Acceptable), a theory by Raymond Loewy who has designed almost everything says that the most advanced design should be given to users, but not more advanced than what they are able to accept and embrace. An innovation is more likely to be welcomed by its user if it lies at the intersection of novelty and familiarity. If the product is full of astounding innovation but people are not familiar with it and vice versa, the chances of failures are high. As people have seen foldable phones and they are familiar with this technology and a foldable screen is actually something new, Samsung Fold I think lies right in the center of the novelty/familiarity scale. The chances of success are pretty high unless it does not have any surprises waiting for us like other Samsung hand grenades. Despite the foldable screen, the device comes with other remarkable features. With 6 high definition cameras, 512GB internal memory and 12GB RAM, it has phenomenal multitasking support. Users can run and interact with up to 4 apps at a time. Left screen, top right, bottom right, and a pop-up screen. I love this feature. 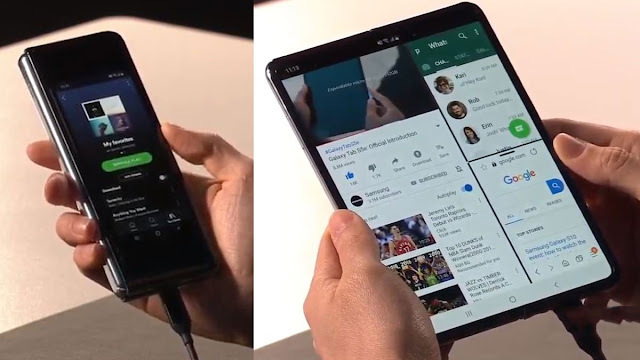 If Samsung Fold failed to earn its users trust, as we have seen many sliding and folding phones failing in the past, this feature would be pretty productive if introduced in tablets. A quick overview of other specs has been give below. When unfolded, Galaxy Fold has 7.3 inches screen which looks elegant and is near to perfect for reading books, watching videos, playing games and other activities. It feels more like an elegant tablet than a phone. However, there is a groove right in the middle of the screen which could be pretty annoying for phone addicts. Although Samsung claim that the screen is created from flexible material and glued with advance technology but the chances of failure are high. It is just an intuition. A personal thgouht. the folded version loses all of its grace and aesthetics and it looks more like a TV remote. It is too large and too heavy to fit in a pocket. I imagine the user would look like an idiot using TV remote in front of no TV. The battery is one of the thing or metric or something else which is usually used to measure the quality of a device. Samsung Galaxy Fold comes with a 4380 mAh battery which is shared by two screens. For normal phone, 4000 mAh battery lasts for more than 36 hrs by standard usage but for this device, two screens have to be maintained, battery won't last that long. It will consume pretty much amount of charge even on stand by. Another stunning feature of the mighty Fold is its 6 camera setup. It has 3 rear cameras, a 16MP ultra-wide camera, a 12MP wide-angle camera, and a 12MP telephoto camera. Telephoto lense provide a narrow field of view to focus better at things at a certain distance. 10MP camera and 8MP depth lense on device front can help you grow your fans on Insta. A 10MP selfie camera is also available if you use the TV remote version of the device. The Samsung Galaxy Fold will be released on April 26 fn the US at an initial price of $1980. Expected release for Europe is in May.